The No. 24 Harvard men’s swimming and diving team is not intimidated by high stakes. This season, the Crimson beat out then-No. 10 Arizona State at the Sun Devils’ home pool, dominated Yale and Princeton to close out an undefeated campaign, and maintained an early lead to take home a second Ivy League championship in as many years over a strong field. This week, Harvard (9-0, 6-0 Ivy) once again rose to the occasion, this time on the biggest stage of all. The Crimson traveled to Minneapolis for the 2018 NCAA Championships and picked up eight All-America accolades en route to an 18th-place finish to close out its season. The result is a significant improvement over last year, when Harvard finished in 27th at the meet. It also sees the Crimson place ahead of a number of highly ranked programs, including No. 8 Arizona State, No. 13 Missouri, and No. 19 Notre Dame. Cornell was the next highest finisher from the Ancient Eight, coming away as the nation’s 23rd-best team. Harvard’s top-20 finish came on the back of a standout performance from sophomore Dean Farris, who collected six All-America honors, including two first-team recognitions. The Atlanta, Ga. Native also broke a solo team record in the 50-yard freestyle before helping the 800 freestyle relay squad to set another new-best mark. In the 800 free relay, the first event of the meet, Farris and the Crimson set the tone for the rest of the NCAA Championships. The Harvard lineup of Farris, junior Brennan Novak, freshman Mahlon Reihman, and sophomore Zach Snyder cruised to an 11th-place finish, outpacing two squads from top-10 programs en route to a program record time. Farris’ leg of the relay was the second fastest of the event, just .02 seconds behind Indiana senior and Olympic gold medalist Blake Pieroni’s. Farris would face Pieroni again in the 200-yard freestyle. The Crimson sophomore vied for a spot in the top three through the first 100 yards, but the star-studded opposition surged towards the end, and Farris ended up touching the wall sixth. The five finishers ahead of him included two Olympic gold medalists, one of whom won with a new NCAA record time, and a World Championships gold medalist. The result earned Farris first team All-America honors, an award that he would double up on by the end of the next day. In the 200-yard backstroke, the standout sophomore ended up seventh with a time of 1:40.37. The Atlanta, Ga., Native would also earn honorable mention All-America recognition in the 50 freestyle, touching the wall 12th overall in 19.28 seconds. Farris’ time smashed a five-year-old Harvard record by nearly a quarter of a second. The sophomore’s final two All-America awards came in a pair of relay events. Farris teamed up with O’Hara, sophomore Raphael Marcoux, and senior Steven Tan for the 200 medley relay, and the lineup finished in 16th place, good for honorable mention All-America honors. The same group also raced in the 200-yard freestyle relay, bettering their finish from the medley relay to end up in 13th, just .21 seconds behind 12th-place Tennessee. The lineup’s qualifying time of 1:16.66 eclipses the previous program record by nearly a full second. In the final event of the meet, the 400 freestyle relay, Marcoux, Reihman, Farris, and O’Hara clocked a mark of 2:52.97, a second-and-a-half off of their time at Ivy League Championships, to grab a 22nd-place result. The Crimson also benefited from some strong performances in the distance events, with juniors Logan Houck and Brennan Novak securing three honorable mention All-America honors between them. 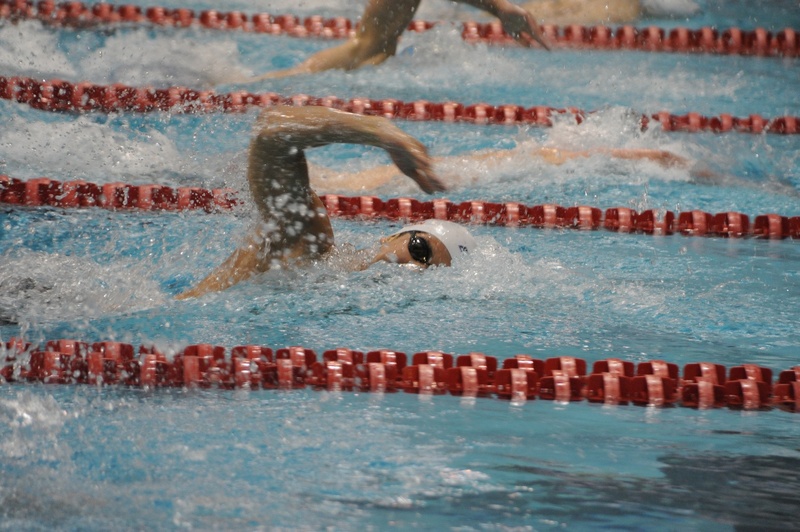 Novak and Houck collected 14th and 16th-place results, respectively, in the 500-yard freestyle. Novak finished just .08 seconds behind the next-fastest swimmer, while Houck touched the wall two seconds later in 4:17.66. Houck would collect another honorable mention honor in the 1650 free, ending up in 15th place. Novak finished up nine seconds behind in a close field, good for 25th overall. Tan also competed in two solo events. The senior finished 45th in the prelims of the 50 freestyle and had the 24th-fastest time in the 100 back qualifiers, narrowly missing out on a spot in the finals. Overall, the Crimson’s performance at this year’s NCAA Championships will go a long way towards establishing Harvard as a nationally competitive program. Beating out a number of top-25 ranked programs in the team points will give the Crimson confidence as it heads into next season, as will the fact that all but two of the team’s NCAA qualifiers are returning for the coming campaign. —Staff writer Sam O.M. Christenfeld can be reached at sam.christenfeld@thecrimson.com. This weekend, the Harvard men’s swimming and diving team continued its dominance in conference play, besting Columbia, 192-107, at Uris Pool in New York, N.Y. and smashing five pool records along the way.